China has set a goal for 20% of new car sales to be electric by 2025. Meanwhile actual sales are tiny. A total of 780,000 on-road PEVs have been sold in the U.S., representing just 0.3% of the 243 million passenger cars and light-duty trucks on the road. [PEVs include both plug-in hybrid electric vehicles (PHEVs) and battery electric vehicles (BEVs)]. In California, less than one percent are PEVs. PEVs accounted for only 1.1% of U.S. vehicle sales in 2017 and were on track to be less than 5% of sales even in California. Many of these are repeat sales to the same households, so an even smaller percent of households are adopting and experiencing these vehicles. And all this with years of purchase incentives, building of charging stations, and outspoken championing of PEVs by California government leaders. Research at the Plug-in Hybrid & Electric Vehicle Research Center of the UC Davis Institute of Transportation Studies indicates few car-owning households are aware of a transition to PEVs and far fewer are actively engaged. Five surveys conducted from June 2014 to June 2017 assessed Californian car-owning households’ awareness of and engagement with PEVs. The percent of car-owning households who had already considered a PEV at the time they completed their questionnaire is no higher in 2017 than it was in 2014. 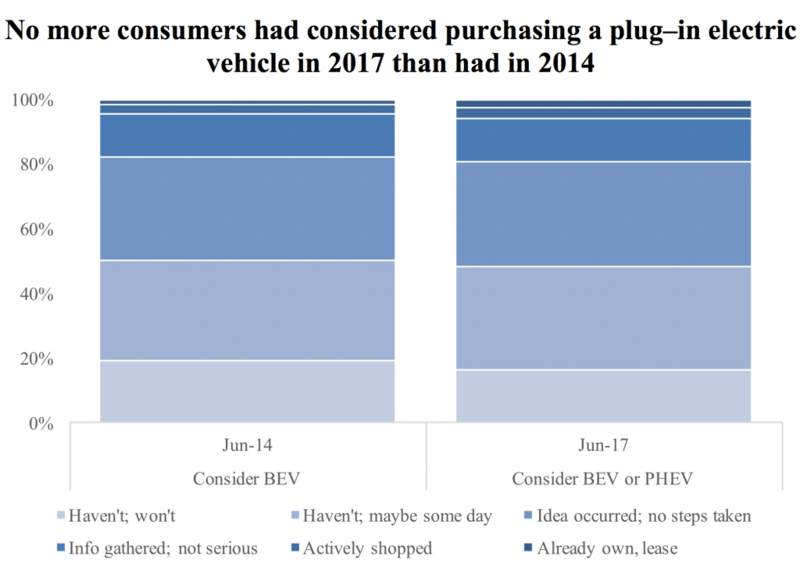 The figure below shows the degree to which consumers in California had considered a BEV (2014) or a BEV or PHEV (2017) for their household. In 2014, barely 5% already owned a BEV or had actively shopped for one. About another 13% said they had gathered some information about BEVs but were not seriously considering one. If one believes a transition to electric drive is well underway, then the percentages of households at these higher degrees of consideration should be larger in 2017—especially as the 2017 data includes both BEVs and PHEVs. They are not higher to any significant degree. According to the California Energy Commission, there were approximately 5,700 non-residential PEV chargers installed in California in August 2014; this more than doubled to over 11,500 by August 2017. By and large, Californians didn’t notice the increase in PEV charging infrastructure. The figure below shows the distributions of how many people report seeing PEV chargers in the parking facilities they use. The doubling of away-from-home PEV charging infrastructure barely registers in the percent of California drivers sighting that infrastructure. In fact, the increases from 2014 to 2017 are so small that the statistically defensible conclusion is they are not different. That’s the good news. Further, we ask households to rate their agreement with the statement “There are enough places to charge electric vehicles” on a scale of strongly disagree (-3) to strongly agree (+3). The mean scores for 2014 (-0.68) and 2017 (-0.61) are not statistically different; both indicate on average slight disagreement there is enough PEV charging. Again, that’s the good news. The bad news? 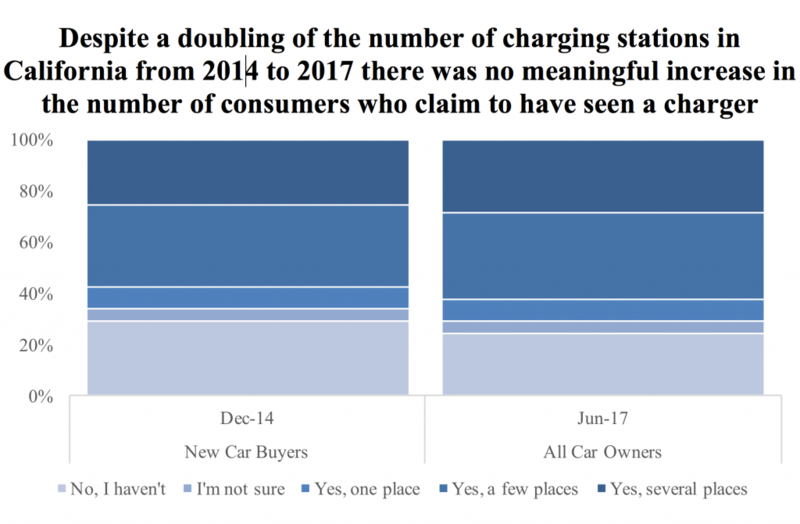 Despite more than doubling the number of away from home PEV chargers from 2014 to 2017, the percentage of California households who registered the strongest disagreement with the statement, “There are enough places to charge electric vehicles”—that is, the percentage of people who scored the statement as -3—nearly doubled from 13% in 2014 to 23% in 2017. What about the increasing number of makes and models of PEVs offered for sale between 2014 and 2017? According the California Air Resources Board’s Drive Clean website, this nearly doubled, too between 2014 and 2017. In 2017, fewer Californian’s were able to name a PEV for sale than had been able to in 2014. Awareness of incentives? Not higher in 2017 than in 2014. Percentage of car-owners that understand how hybrid, PHEV, and BEVs vehicles are fuelled? Not higher. Dr. Ken Kurani is an associate researcher and Dr. Scott Hardman is a postdoctoral researcher at the Plug-in Hybrid & Electric Vehicle Research Center at ITS-Davis.